It’s bound to happen. You’re done eating lunch, you go to rinse your mouth out to get food off of your braces…but it’s stuck! Allowing food to sit in or around your brackets can cause damage to your orthodontic appliances and teeth. Thankfully, there are useful tools for tackling stuck-on food. 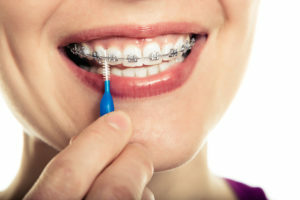 Here are some tips from our expert for braces in Raytown, MO, to keep in mind when caring for your braces. Contact Our Expert for Braces in Raytown, MO, today with any questions or to schedule an appointment! The information provided in this article is not meant to be medical advice and is for educational purposes only. If you would like to learn more about braces, Invisalign, or other orthodontia-related topics from our expert for braces in Raytown, MO, feel free to contact Burleson Orthodontics by calling 816.759.0123.